Wishing all my Readers "A Very Very Happy Deepavali" the Indian festival of lights. These were her words when R came back from her school the other day : "Wow! U made them?? I knew U made something like bread I could smell it. Do U have Cheese sauce/dip with it???? And in reply to her Cheese dip question when I said sorry I didn't had any yellow cheese in the fridge, in the mean while she had her first bite, she goes "these are good BUT Aunt A's are better. YES! Auntie Anne's from the mall, we all have eaten it some or the other point and O'course they come with the DIP, and I didn't had any. BUT wait, the moment she had few more bites and she goes but I love the salt part, actually these are REALLY GOOD. She polished off two. I did melted a cheese slice for her, as on the name of yellow cheese that was the only thing I had but the moment it got off the heat it kind of got hard & not melted any more. So note to myself : next time I make these make sure cheese dip is ready first & I'm sure then Mom's Pretzels will be best and not next to the best. Now before jumping to the recipe, few days back I found this blog called applecrumbles & the post I landed up on was about summer rolls, yes ! the kind U make using rice paper wrappers, I read it because it was a good co-incidence that couple of days back only I had bought a pack of rice paper rolls & since then they were are sitting on my counter top. No, I didn't made those but instead at the end of the post she had mentioned that Next Week "we will be making pretzels, want to make pretzels with us ?" At that moment itself I emailed her & by the night she emailed me the recipe. She and one of her friend are following a book called "Fusion of Food + Friends" and every week they make one recipe from that book. Now, I got the recipe and before jumping to baking I did little online search, and it was little as I checked first two links of the search result & I was set to go. Plus one more thing I did do little extra search about Yeast also but that's a topic for some other day. I used kitchen aid stand mixer to make the dough but one can easily do it with hands. 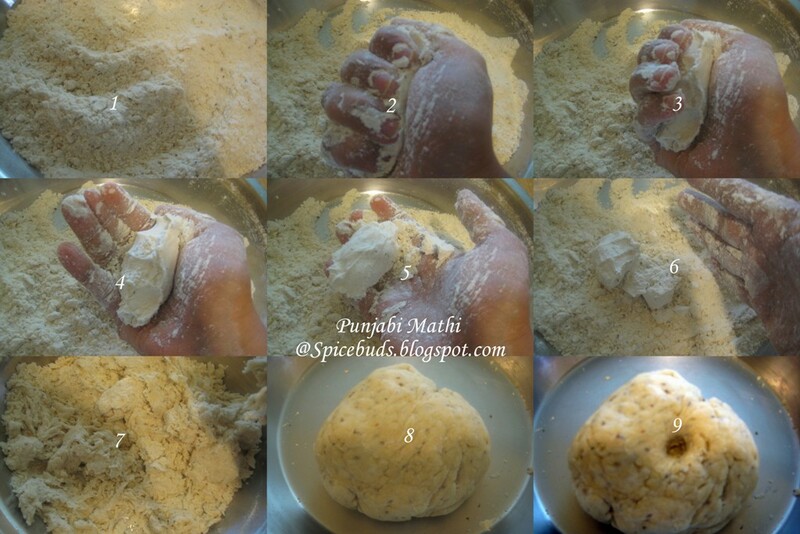 Mix salt flour & yeast together. Add rest of the ingredients from the dough list. Knead it to the consistency where the dough is no more sticky. Rub some oil on the dough ball & keep it in some big oiled bowl. 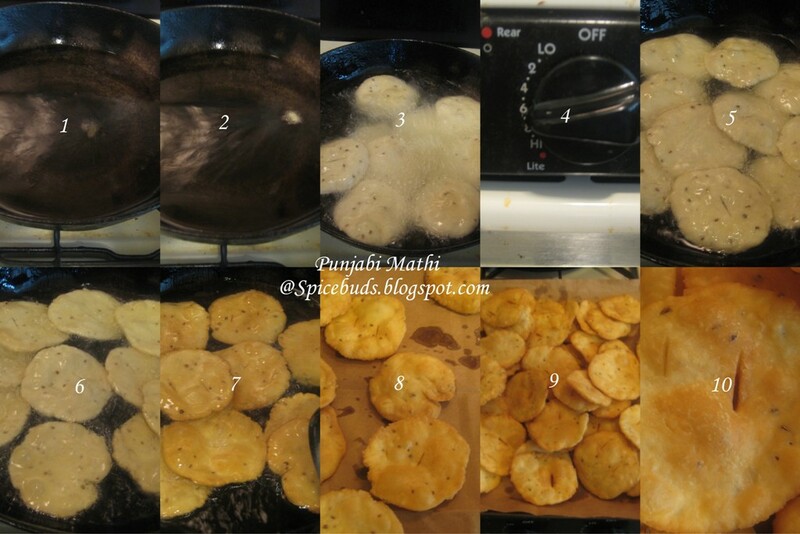 Cover & let it sit in some warm area of your kitchen for at least 1 & 1/2 hour or until it get almost double in size. Mine was sitting for almost two hours & it was more than double after rising. Preheat the oven to 400 degree. Line a baking sheet with parchment paper & lightly spray it with cooking oil/spray. Getting water bath ready : Heat the water & dissolve baking soda in it. Be careful when U add soda to the hot water, it gonna get all bubbly & sprinkly. Take the dough on a lightly floured surface divide it into 5 equal parts. Now take one dough ball & roll it into a big rope and shape it like a pretzel. Here on this blog U can see step by step pictures or I'm sure U can find many videos about how to roll a pretzel on U Tube or learn it from the experts : make a trip to your local mall & have a live demo of how to roll a pretzel in Auntie Anne's shop. Once the pretzels are shaped take them one by one & give them a hot soda bath. 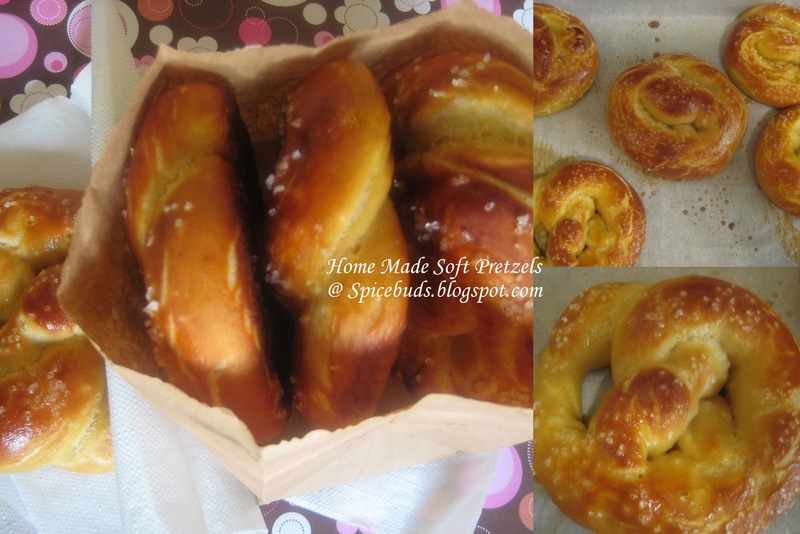 Gently drop one pretzel at a time into the bath, count to 10 & using slotted spoon take it out & place it on the ready baking sheet. Sprinkle some coarse sea salt if U wish. 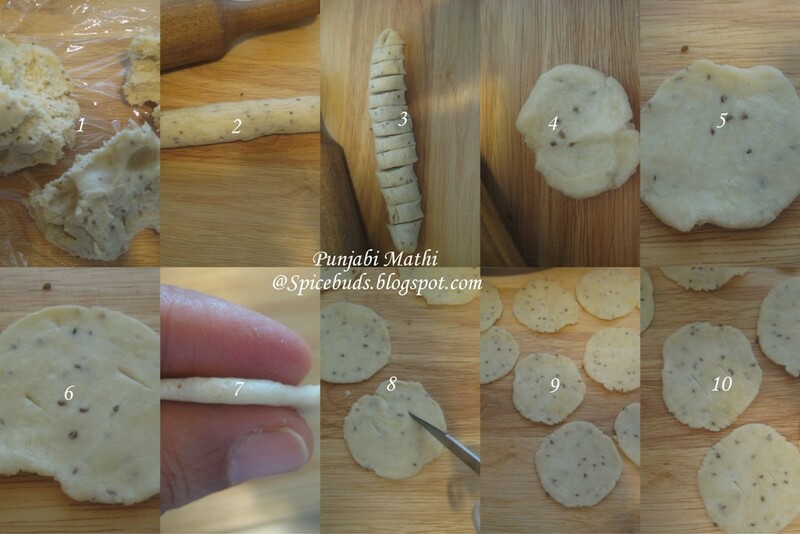 Bake them for around 10 minutes or till they get brown on the top. Mine took good 15 minutes. When come out brush them with some melted butter. Note : I used 1 qt. small pot for soda bath, if using big pot double the quantity of water & soda so that there is enough water for pretzels to float in. These were good look wise and taste wise, very soft from inside, but they were not as chewy as store bought ones are. That could be because of I used milk & olive oil in it but I'm not sure. But as the overall result was so good I think it's a keeper recipe. 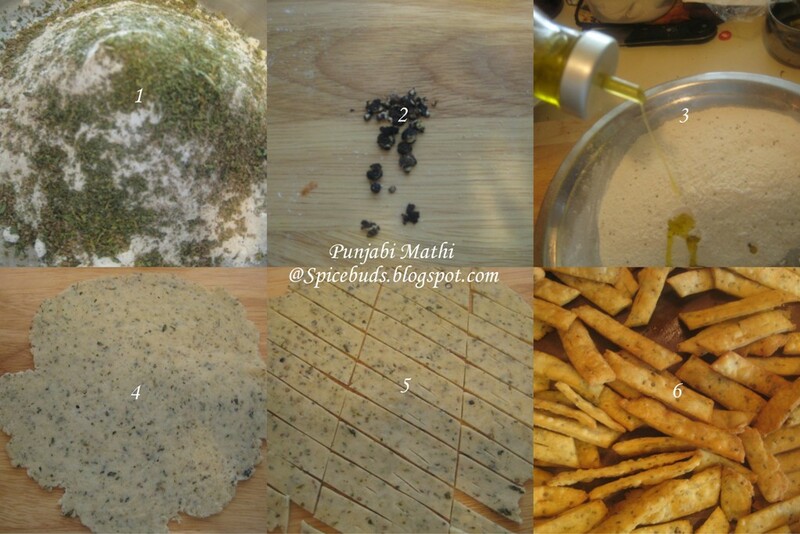 Idea of using milk & honey instead of water & white sugar was an inspiration from this & this blog. These delicious Pretzels are on their way to Susan's Yeastspotting. And yes! I just noticed that 's is missing :-( from the tag which I made at the last moment in hurry. 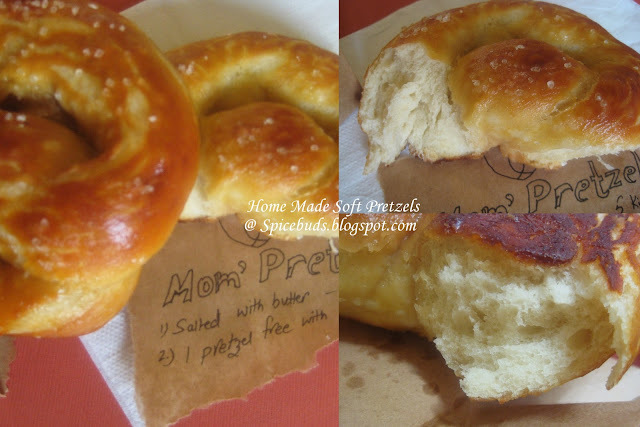 So, please put an imaginary 's to read it as Mom's Pretzel & not Mom Pretzel. I'm Back, with hope to blog regularly. More than 3 months have been passed since I posted any recipe here. Time flies, I totally believe in that. Back in June I was writing about our strawberry picking experience(never posted) and sudden plans of vacation to India kept me busy for a while and it's already pumpkin & apple picking season now. 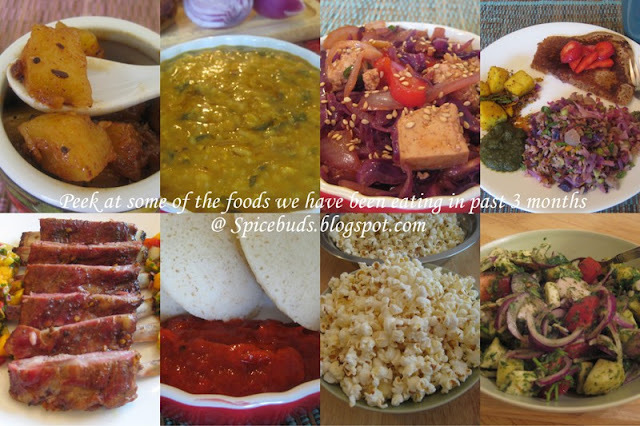 Even after coming back every single day I blogged but only in my thoughts, with every new day clicks of new dishes and still they didn't get to see face of this blog. Finally, today I decided to share with U guys, little bit of what I captured in my camera in the past three months to get out of this break and hopefully to regular blogging as I do miss reading wonderful posts by my favourite bloggers and O'course I'm missing, reading comments by all you wonderful bloggers. I clicked so many pics but didn't got a chance to post about them, I even managed to click the salad(right bottom corner) which I ate the night before we left for our trip to India. It was just to finish whatever I had left with of fresh produce : apples, tomatoes, onion, pears, paneer(Indian cheese) with generous amount of green chutney(a common & must have condiment in any Indian kitchen). It was good & filling. 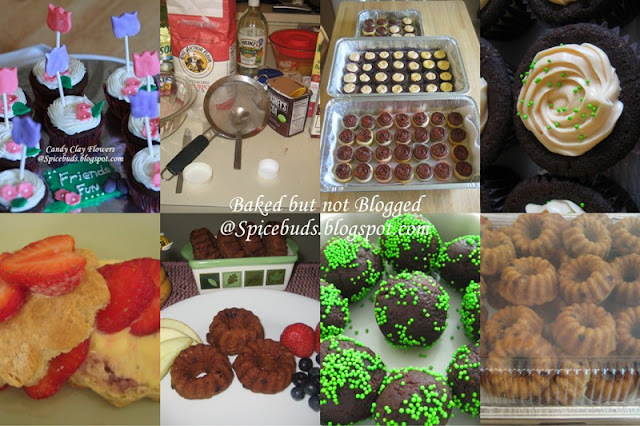 I love baking, you see those big trays of cupcakes & mini bundt cakes those were baked for some celebration at our Gurudwara(Sikh Temple) back in May and it was all eggless. First time I baked in such a large quantity, 72 cupcakes + 44 mini bundt cakes + one round of 12 cupcakes which was gobbled by kiddos & their friends as house was smelling so good they kept roaming around the kitchen. Monsoon in Dilli(Delhi, capital of India) welcomed us by coming 4 days early, to match with our arrival day. It was so perfect timings, drizzling all the time till we reached home, at airport my 9 yr. old was complaining : great it's raining we won't be able to play outside and just after couple of hours she had best time of her life soaking in those downpours. 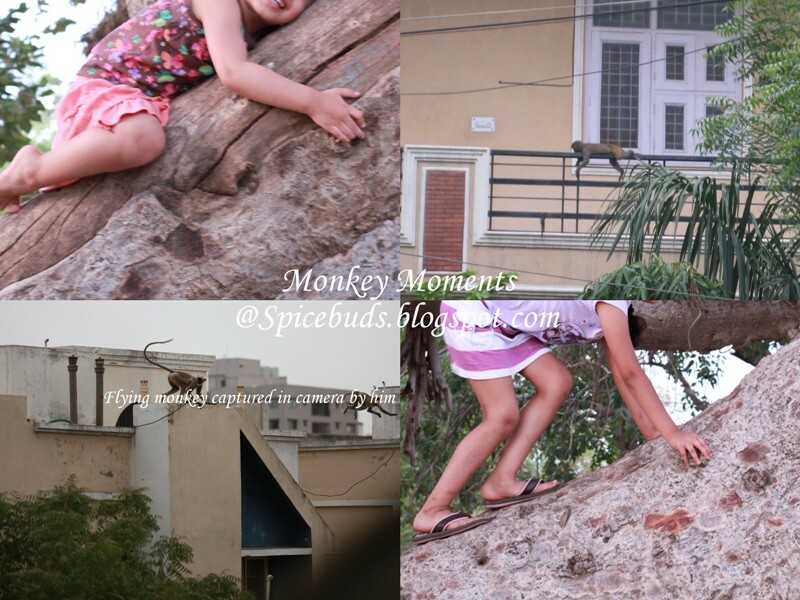 First showers of first Indian Monsoon for Kiddos, as this was the first time we went in summers. There is something special about the Indian monsoon it seems perfect to soak in those rains( i think some of the credit also goes to Bollywood movies, for giving us some classic rainy songs) and later enjoy some hot pakoras & samosas. Yes, Samosas were eaten every single day rain or shine during our stay in Dilli and Kachoris, Mirchi wada & Jalebi were our everyday breakfast while we were in Rajasthan. Some time we don't need lot of technical stuff like DS, Wii, iPad or some other hi fi toys to amuse kids. Mouse caught in a cage overnight, can really provide U with hour of fun before your kind heart go out and leave that mouse free 2-3 streets away from your house, to be caught by some one else if he dares to enter their house. 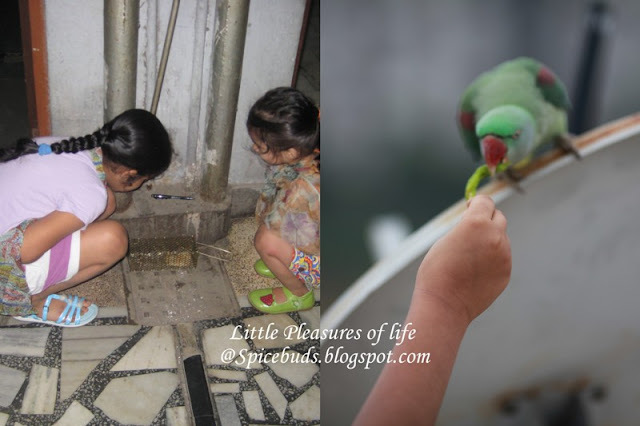 OR if that's not your kind of fun than I'm sure U would love to feed food to birds, in our case it's a parrot who for some reason decided he like our terrace for his early morning lazy time, it may be the kids or hari mirchi(green chili). 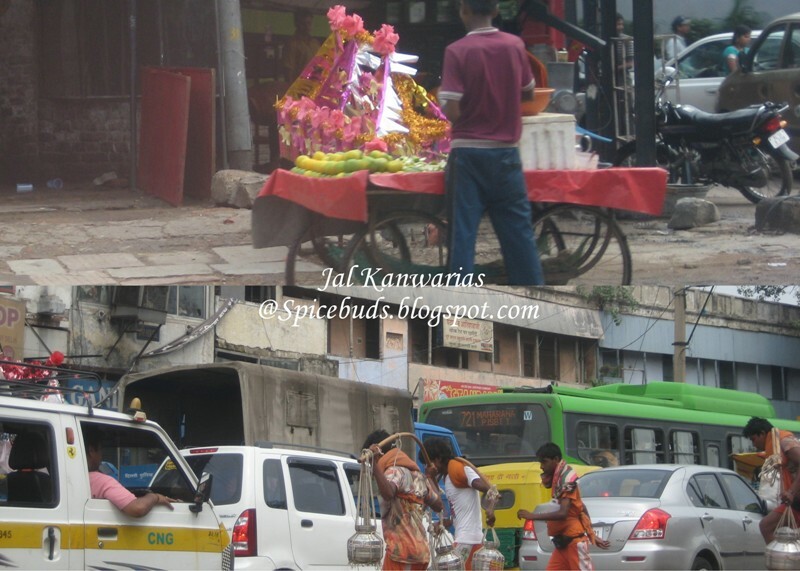 After 12 years, I not only saw Indian Monsoon but also saw dilli flooded with Kanwarias once again. Ask any dilli wala and U will know during the shravan month acc. to Hindu Calender which usually falls in rainy season between July august, roads will be blocked, traffic will be diverted & some roads will be even closed for this whole period. Because this is the time when these Saffron-clad Kanwarias start their journey back to their home town, barefoot with pots of ganga-jal(holy water) carried on their shoulders, filled from holy river Ganges in Haridwar. They take ganga-jal to offer to Lord Shiva in their village These people come from all the northern states of India and cross dilli on their way to Haridwar. As per the tradition water should not touch to the ground, so thru out the city there are camps for their rest & stands are made to kept the kanwars(pots). In top picture one of the decorated kanwar carrier is resting on street vendors cart. What was new this time for me, that on a very busy ring road(call it a life line of dilli), section of good few kilometers had a dedicated line for Kanwarias. Govt. tries to keep accidents & mishaps at minimum. It might be a good amusement for first timer to see all this but it really slow down the city and even stop it sometime. 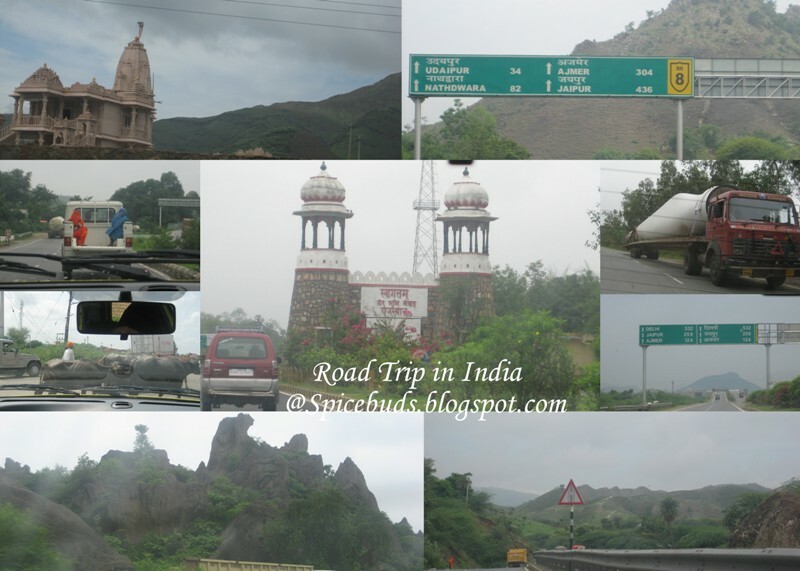 What's your favourite thing when U go on road trips & you are not driving. Mine is to take pictures & lots of them. U really need to take lots of them because when U r trying to take a picture from moving car, holding your toddler with one hand, at least 60-70% of photos are not going to be of good quality, then in some U gonna miss the object U were trying to catch. But if U are lucky like me who have a husband, who manages to overtake the truck after doing lot of zig zag & rather than speeding back to 130 km/per hour, just adjust the speed so that I can take the picture of that same truck which we just overtook. Why ? because how many times U see a panel of windmill travelling on a truck, well for me I had seen windmill farm, but windmill panel travelling on a truck was first time and it was huge. I love to take pictures of highway nos. & signs, I'm clever no need to write anything when after few years kiddos will look at the pics they will know which place that trip was for. And most important is the scenery, no matter how many times I have travelled this region, the Aravalli mountain range has such a charm in it I always find it beautiful, surrounded by those beautiful mountain peaks journey is never tiring. Thanks, to all of you, who stopped at this space while I was away. I'll be back soon with some yummy recipe from my kitchen.